Question: What is "heat shrink film"? Answer: Heat shrink film, also called, heat shrink wrap film is a material made of of polyethylene sheeting/ film that when has heat applied to it, it shrinks. The concept is to tightly place a barrier around what ever the structure/ item that one wants to protect. Question: Do you have a heat shrink wrap product that I can use outdoors to protect my boat and other recreational items? Will it hold up to the sun and snow? 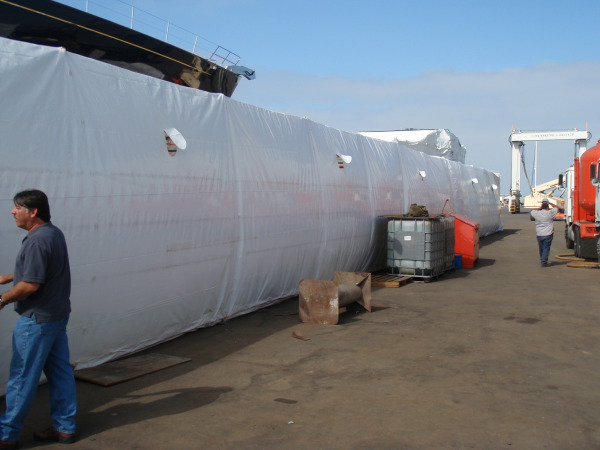 Answer: 9 Mil Heat Shrink Wrap is used all the time by our customers to do just that- shrink wrap just about anything they want to store outside. The UVI in the film will protect the film from the sun and elements. By shrink wrapping you are keeping the plastic from buffeting in the wind. Customers find using heat shrink wrap film as a cost effective way to store things outside. Click here for more information on 9 mil UVI Shrink Wrap Film. Heat Shrink Wrap- PVC vs Polyethylene...What's the difference? Question: I understand the two more popular types of heat shrink wrap film on the market are made from PVC and Polyethylene. What's the difference between the two? Answer: Essentially, PVC plastic is thicker and more rigid than polyethylene heat shrink wrap film. Some compare PVC to cellophane while polyethylene film is soft like the wrap you put over food. When one does the actual shrinking of the film, a higher heat is used to shrink polyethylene film as compared to PVC plastic. The PVC will off-gas while the polyethylene won't. We Want To Answer Your Questions.... Let's Wrap!